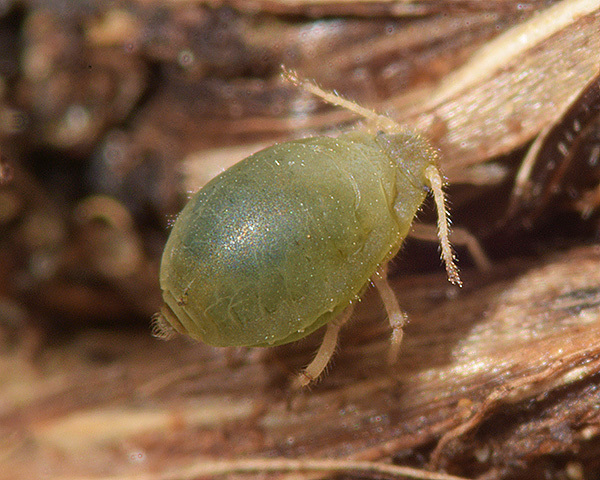 The primary host, Pistacia, does not occur naturally in Britain, so not surprisingly we have only found the crusty pistachio-grass root aphid on its secondary host, grass roots. 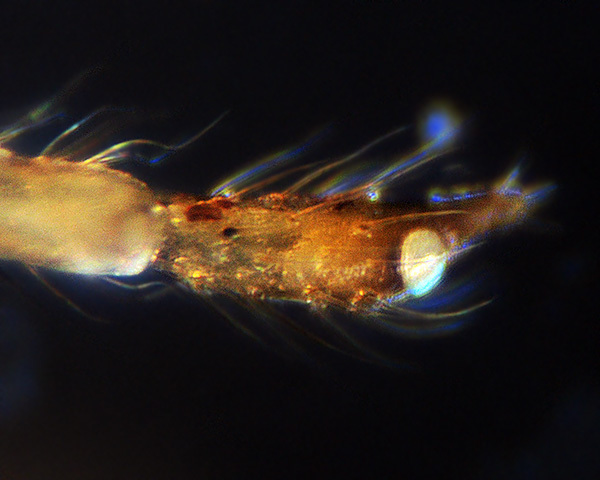 Most of the colonies we have found have been on the roots of annual meadow grass (Poa annua) growing as a weed usually on the edge of concrete or tarmac. 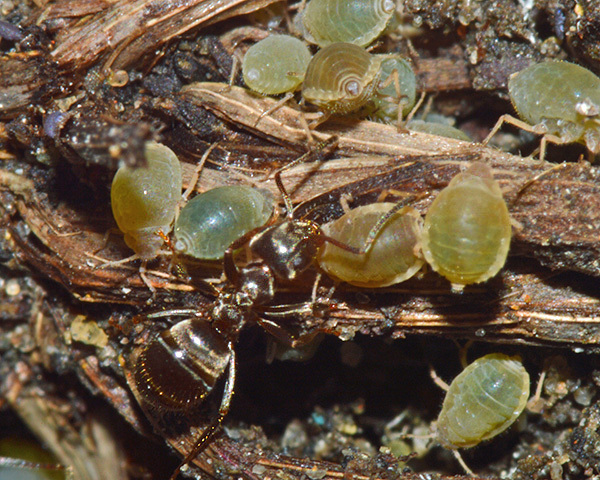 The presence of Forda marginata is sometimes indicated by earth tenting carried out by the attendant ants, although this may be for other species of grass root aphid found on the root collar. 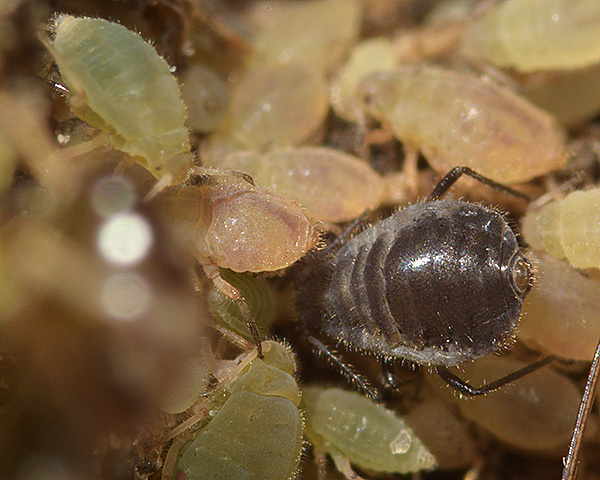 Forda aphids can be separated from other genera on grass roots by their characteristic highly domed body which can best be seen in side view (see picture above). 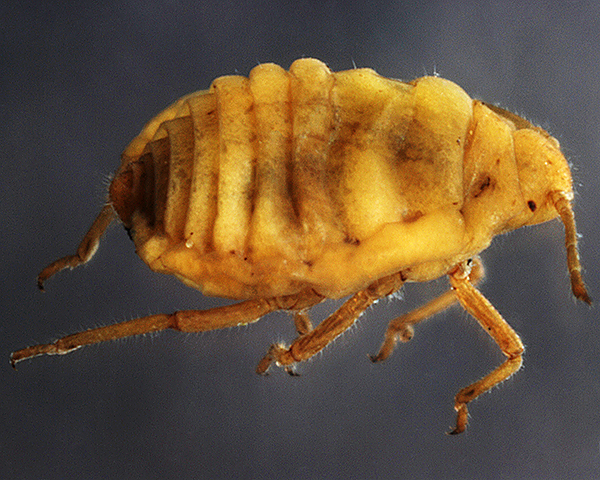 Paul (1977) considered Forda marginata, an obligate myrmecophilous species, being almost always found with Lasius flavus. 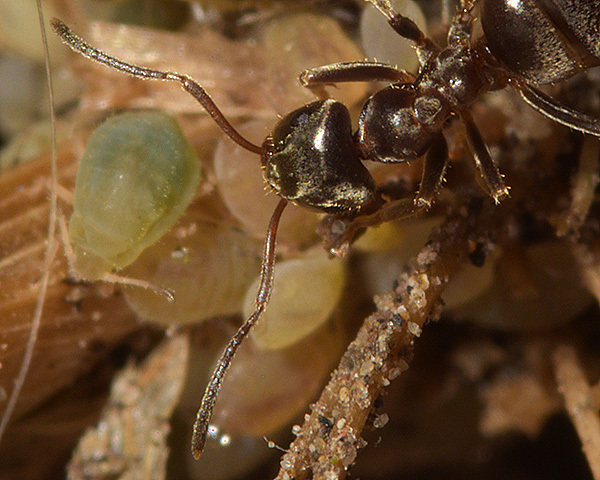 However, if Lasius flavus is not present, Forda marginata seems equally at home with Lasius niger (see picture above and below). 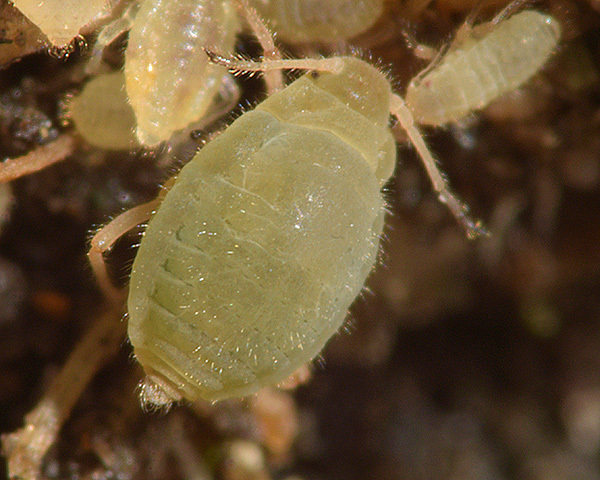 Paul (1977) found at least 16 other aphid species recorded on grass roots in Britain: Anoecia corni, Anoecia furcata (= A. nemoralis), Anoecia major, Anoecia (Paranoecia) pskovica Mordvilko, Anoecia vagans (= Anoecia willcocksi), Anoecia zirnitsi, Aploneura lentisci, Baizongia pistaceae (=Pemphigus cornicularius), Forda formicaria, Forda marginata, Geoica setulosa, Geoica utricularia, Paracletus cimiciformis, Rhopalosiphum insertum, Smynthurodes betae and Tetraneura ulmi. 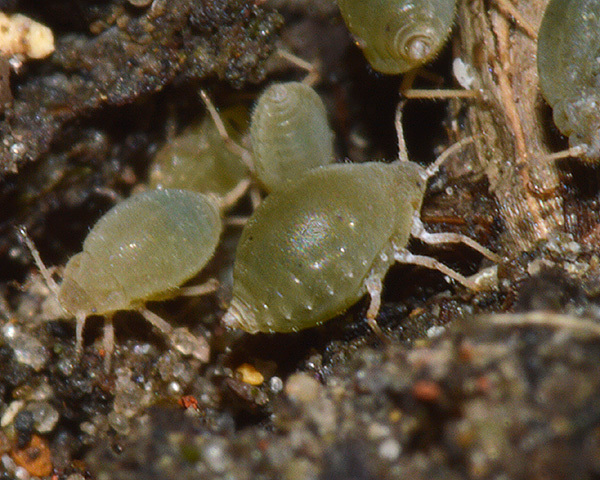 It can be especially difficult to identify root aphids in the field because they often occur in mixed species colonies, such as shown in the picture below. 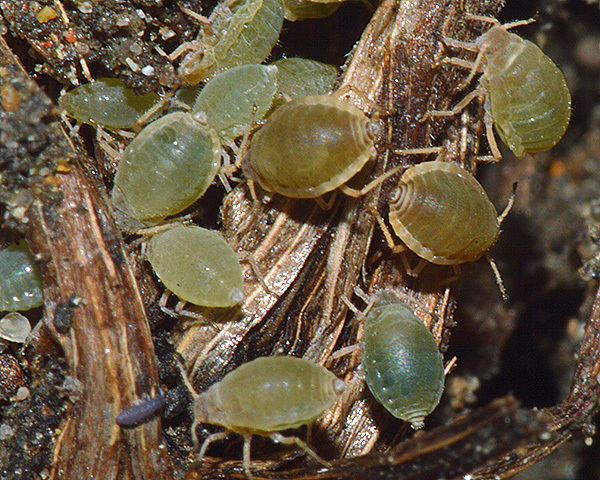 The pale green aphids are Forda marginata, but the heavily sclerotized grey-black aptera is an Anoecia species with its pinkish yellow immatures.